The fact that Easter falls on April Fool’s Day raises an interesting question. Are we fools to believe in the crucifixion and resurrection of Jesus Christ? Crucifixion is brutal and barbaric, and resurrection is impossible. Dead people stay dead. So, why do we believe THIS FOOLISH FAITH of ours. Many think the Gospel is foolishness and think we are fools for believing it. The Apostle Paul experienced the same thing in his day, and wrote, “The message of the cross is foolishness to those who are perishing, but to us who are being saved, it is the power of God” (1 Corinthians 1:18). We have to admit that the cross is a brutal and barbaric story, and an odd story to be the basis of our faith. But here’s why we believe it. Jesus took our place on the cross and paid the penalty of our sin so that we might be forgiven of everything we’ve ever done wrong. The cross is God’s love. The cross is our rescue. That’s why we hold to THIS FOOLISH FAITH. It may look foolish to some, but to us, the cross is the greatest demonstration of God’s love. But there’s more to the story. Easter. Easter is not about celebrating the return of spring. Spring is an actually an illustration of the Gospel, of the promise of death to life. In the cold of winter, we wonder if life will ever return, but it always does. God’s promise of resurrection is just as certain for those who believe in Christ. That’s the Gospel. The Apostle Paul conceded to the critics that without the resurrection, the Gospel crumbles. He said, “If there is no resurrection of the dead, not even Christ has been raised, and if Christ has not been raised, then our preaching is vain, and so is your faith” (1 Corinthians 15:13-14). If the resurrection did not happen, there is no Gospel. If the resurrection never happened, it would be foolish to believe it. But if it did, it would be foolish not to believe it! 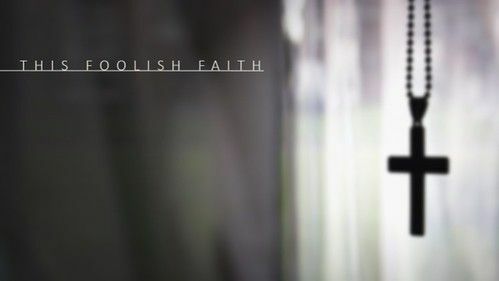 As Christians, we choose THIS FOOLISH FAITH. We believe Jesus is alive. We believe that He actually, physically, and supernaturally rose from the dead proving to be the Son of God and proving that everything He said is true. We believe, that through faith in Him, we can be forgiven of everything we’ve ever done wrong. And, we believe that one day we will see Him face to face and spend eternity with Jesus in heaven. We gather on Easter to affirm our faith, to celebrate our faith, and to renew our commitment to live like we believe it.